Today we visited the San Miguel Mission in Santa Fe, New Mexico. Built in 1610, the mission is famous for being the oldest church in the United States. We prayed to our tour patron Saint Michael to bless our campaign in Santa Fe. 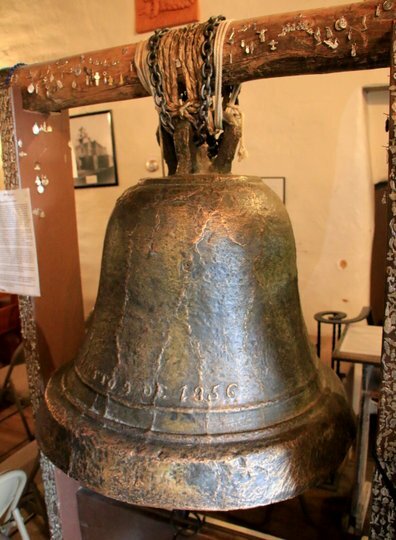 During our visit to the mission, we saw an old Spanish bell dating back to the 1300’s. At that time the Spanish were engaged in the Reconquista of their homeland against Muslim invaders. After the special assistance received from Saint Joseph to win victories against the Moors, the bell was made in gratitude to him. It was later brought by the Franciscans to Santa Fe. We were overjoyed, to say the least, to have the privilege to ring that same bell today. We then campaigned in the plaza close to the Saint Francis Basilica. Most of the public were American tourists. Several were from other countries. This sort of opposition was characteristic of some of the business owners in the plaza. We found a better corner with a lot more foot traffic. Here we shouted our slogans, prayed the rosary, and sang hymns. Soon another business owner from one of the stores appeared and he was very angry. He demanded to know if we had a permit. We told him the First Amendment gave us all the permission we needed to assemble peacefully in public. But he insisted that we needed a permit and were breaking the law. We politely told him we were within our rights. He got angry called the police. We continued our campaign. Then he threatened us with a lawsuit. 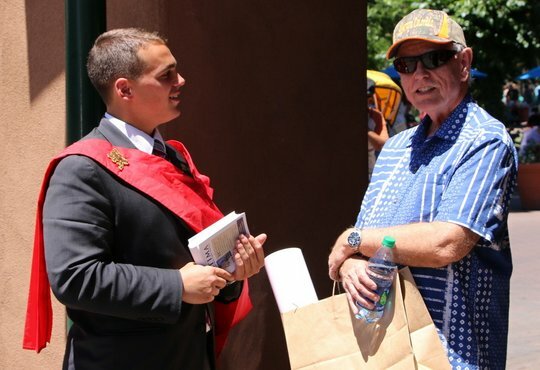 When the police didn’t come, he physically tried to prevent TFP volunteer Zechariah Long from giving out flyers about Our Lady of Fatima . He ripped the flyer out of the hands of another TFP volunteer. Again he got into Zechariah's face. The police appeared. They were kind and professional. I told them we were exercising our First Amendment rights without blocking traffic or sidewalks. They said they had asked people about our presence and confirmed what they themselves had observed: TFP volunteers were peacefully following the law. They said we were fine. After the police left, the belligerent shop keeper never showed up again. In the meantime, many people thanked us for our public action. One man said he wouldn’t take the flyer because he wasn’t Catholic, but agreed with our campaign and thanked us. We gave out nearly 1,000 Fatima flyers. A second business owner appeared and told us we had to be 50 feet away from the stores. When asked why the police thought what we were doing was fine, he accused us of lying. He said he was watching the whole time and never saw the police. When a TFP member explained that this is America and we were expressing our First Amendment right, he just cursed and yelled: “Don’t you tell me about America! I am more American than you are.” He shouted more expletives. The harassment lasted a good while. But by the time the campaign ended, the plaza had become very calm, surprisingly calm. It was an angelic calm. All the agitation had vanished. Was it our prayer to Saint Michael? After we finished the campaign, we went to pray before the image of Our Lady La Conquistadora. 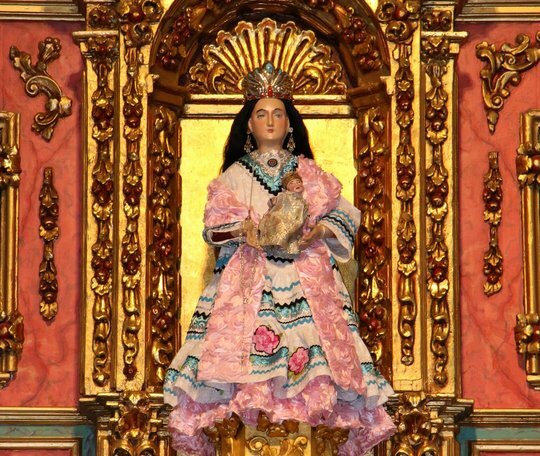 This is a centuries-old statue that came to the New World from Spain, one of the oldest Catholic shrines dedicated to the Blessed Mother in America. We went to the sanctuary of Chimayo to pray before the crucifix known as the Christ of the Esquipulas. This crucifix was miraculously discovered by a man named Bernardo Abeyta on Good Friday in 1810. 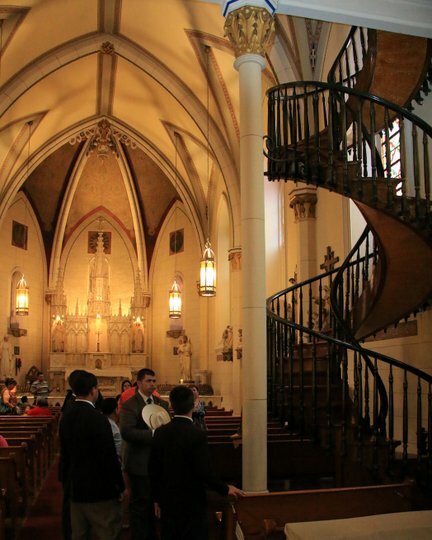 We were also blessed to see the miraculous Saint Joseph’s Staircase in the Loretto Chapel. The weather changed dramatically. We were surrounded by dense storm clouds and could see downpours in the distance. The wind was so strong that we had to role up our Rosary Rally banner for fear that it would tear in half. The fabric of the red TFP standard snapped in the wind. Curiously, the rain never came. 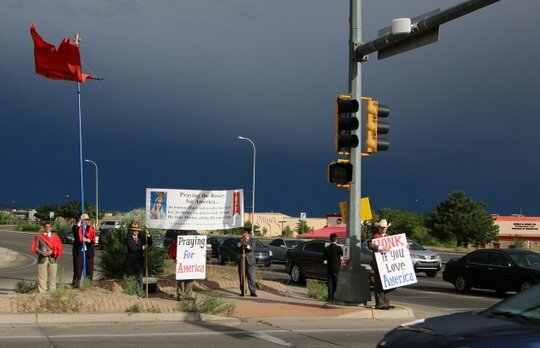 In Amarillo we had an enthusiastic reception with at least 800 honks. As soon as we began the rally, three different men came to talk. The first approached Zechariah Long and said he had just been on our website and couldn’t believe he and his wife had just seen us set up the campaign. His wife asked him to stop and talk. He mentioned the Call to Chivalry camps because he wants his son to attend one. The second man was a bit stern. He said prayers are only going to get us so far and that we need to take action. The third man asked if we he had ever heard of various Catholic prophecies he was currently reading about.A distinguished lady driving a car stopped and asked her maid to ask one of the TFP members to come over and speak to her. She told TFP member Alvaro Zapata that she totally agreed with what we were doing and asked if we accept donations because she wanted to support this TFP effort.